Pedro de la Rosa is the BMW Sauber F1 Team’s second driver for the 2010 season. The 38-year-old Spaniard has 71 Grands Prix under his belt and worked with McLaren as a test and reserve driver for seven years. In December the Swiss team had already announced it had signed on Kamui Kobayashi. Pedro de la Rosa was born in Barcelona (ES) on 24th February 1971. He has lived in Zurich (CH) for several years with his wife Maria Reyes and daughters Georgina, Olivia and Luna. De la Rosa began karting at the relatively late age of 17, but was immediately discovered and sponsored by the Spanish Automobile Federation. A year later he had already progressed to a single-seater racing car and went on to win the Formula Fiat Uno. After successful stints in Formula Ford, Formula Renault and British Formula 3, 1997 saw him win the Japanese Formula 3000 and GT Championship. In 1998 he made his debut as a Formula One test driver for the Jordan Team. He contested his first Grand Prix in Australia in 1999 for Arrows, taking his inferior car straight into the points with a sixth-placed finish. He remained with Arrows in 1999 and 2000, moving to Jaguar for the 2001 and 2002 seasons. 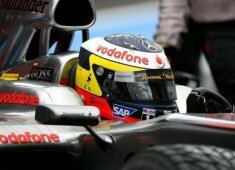 From 2003 through to 2009 he worked for McLaren-Mercedes as a reserve driver. Called upon to race for the team in nine Grands Prix, he capitalised on these opportunities. In 2005 he finished fifth in Bahrain and claimed the fastest race lap. 2006 saw him stepping into the breach again: in eight races he managed to pick up 19 World Championship points and took a podium place by finishing second in the 2006 Hungarian Grand Prix.